Publicly-traded US-based designer and manufacturer of grid-scale lithium-ion battery storage solutions. Powin’s commercially-proven integrated battery systems are uniquely suited to meet the demands of the utility-scale storage applications. Powin’s patented bp-OS battery management system features 24x7 remote monitoring and control, including managing charge/discharge operations, energy balancing, and system condition and performance monitoring. International investment firm with over $3 billion in assets under management. Exceptional investment track record since inception in 2006. Experience in private equity, venture capital, hedge funds, private real estate, and real infrastructure assets. Based in Brisbane, Australia, with additional offices including in New York, in the USA. 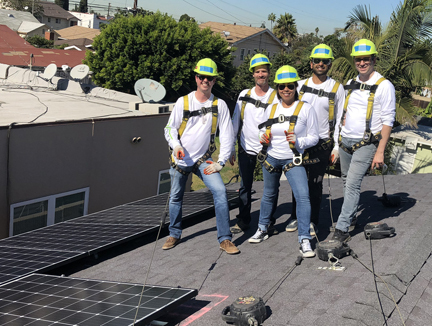 On November 2, 2018 esVolta teamed up with GRID Alternatives GLA to bring renewable energy technology to an underserved community in Long Beach, California. Overall, a great day of teamwork, learning and social contribution!